Johan Heilbron & Yves Gingras, «The Globalization of European Research in the Social Sciences and Humanities (1980-2014): A Bibliometric Study». in J. Heilbron et al. 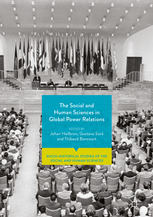 The Social and Human Sciences in Global Power Relations. London : Palgrave Macmillan (2018) 30 p.
This volume employs new empirical data to examine the internationalization of the social sciences and humanities (SSH). While the globalization dynamics that have transformed the shape of the world over the last decades has been the subject of a growing number of scientific studies, very few such studies have set out to analyze the globalization of social and human sciences themselves. Arguing against the complacent assumption that Science is ‘international by nature’, this work demonstrates that the growing circulation of scholars and scientific ideas is a complex, contradictory and contested process. Arranged thematically, the chapters in this volume present a coherent exploration of patterns of transnationalization, South-North and East-West exchanges, and transnational regionalization. Further, they offer fresh insight into specific topics including the influence of the Anglo-American research infrastructure and the development of social and human sciences in postcolonial contexts. Featuring contributions from leading international scholars in the field, this work will advance the research agenda and will have interdisciplinary appeal for scholars from across the social sciences. Ce contenu a été mis à jour le 7 mars 2018 à 16 h 04 min.